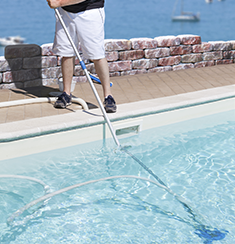 Looking for a dependable provider of pool care and maintenance services? Protege Signature Services offers quality services to swimming pool owners in Port St. Lucie, FL. Using our experience, skills, and equipment, we can make your poolside a fun place for the family all year round. We are a locally owned and operated business that has been maintaining both residential and commercial swimming pools since 1987. Over the years, our licensed and insured crew has developed the necessary skills to provide high quality services in a short amount of time. Today, we take pride in what we call the Protege Signature Difference: Affordable, Professional, Honest, and Fast Service. These four characteristics are the keys to our unstoppable success in the industry. Talk to a leading pool care service provider for superior repair and maintenance. Our team will stop at nothing until you and your family can enjoy swimming in a clean and pristine swimming pool. If you would like to schedule a pool cleaning appointment, call (954) 746-8989 or (772) 621-7988. We look forward to serving you. Copyright © Protege Signature Services, 2015. All rights reserved.